For some of my JIRA filters (and for JIRA lists on some of my Confluence pages) I need to display all closed JIRA tickets as last and all in progress in the beginning of list. Using ORDER BY status failed because Closed isn't neither first nor last status name when ordering status names alphabetically. It assumes that any JIRA ticket in progress has resolution set to Unresolved which in JIRA means "empty value" and causes all tickets with such resolution to be displayed first and all tickets with Resolution != Unresolved to be displayed as last. I'm using newest version of webtrees (1.7.9) and even though I have Control panel > Manage family trees > Preferences > Lists > The date and time of the last update set to Hide, I could clearly see that field in Facts and events sections of each person's record. Read More "Hide “Last change” field in webtrees"
Read More "Extremely fast way to download a Twitter video"
There's an extremely fast, two-step way to download any Facebook video to your local computer. You don't need any software or 3rd party website. You don't actually need anything, except for the any web browser and Facebook account, you'll be logged-in to. Downloading any Facebook video in just 10 seconds! Impossible? Read More "Extremely fast way to download a Facebook video"
This is a revised and updated version of this Super User answer on how to easily remove default search engines in Opera browser. By default they're not editable or removable at all. Official statement is, that this feature was "forgotten". But, we all know the facts, that Opera is being paid for keeping these default search available and making removal of them as hard as possible to the end user. Read More "Remove default search engines in Opera"
If you're annoyed with Tools / Fill & Sign / Comment right sidebar in Adobe Acrobat Reader (it is pretty useless, but still occupies a lot of space), then you can hide it with a simple trick. Press Ctrl+H or select View > Reader Mode to enable Reader Mode. This will hide all extra stuff (all toolbars and sidebars) except actual document area. If you would like to bring left sidebar (with navigation panel etc.) back, then simply press that keyboard shortcut or select that menu option again, to disable Reader Mode. Left sidebar should return, while right sidebar should remain hidden. On contrary to BitBucket, GitHub does not allow you to have private repository with public issues. But, you can setup a two different repositories -- private for code hosting and public for issues (read more in GitHub Help). And, what is most important and what not everyone knows -- GitHub's commit message's grammar parsing is powerful enough to handle crossed commits. Read More "Private repository with public issues on GitHub"
To quickly access some partner or remote computer in TeamViewer 10, you can login to your account, check to be always logged it, and add particular machine to the list there. Each time you start TeamViewer, you'll have list of your computer ready in a window to the right. All you have to do, is to double click any item in that list. Can it be even faster? Can we initiate TeamViever session to particular machine or customer by double clicking icon on Windows desktop? Sure thing, we can! Read More "Shortcuts for direct TeamViewer session on Windows desktop"
Read More "Plural formula in PHP to evaluate ending for a number in Polish language"
Software licensed under COA, OEM and similar licenses can be legally sold on European Union area, according to Court of Justice of the European Union's verdict dated July 3, 2012. It judged that both private persons and companies can sold original software and licensees purchased from companies like Microsoft. This judgement is a direct interpretation of the law of European Union directive 2001/29/WE, which says that producer's law for an exclusive distribution ceases with the moment of software selling for the first time and producer or IT company cannot legally block any attempt of re-selling such software attempted by the person or company, who initially purchased it. Read More "Cyclic jobs in Yii and MySQL"
One of the newest updates of Notepad++ has introduced new, quite annoying Edit with Notepad++, item added to many context menus. Since, there isn't an option in Notepad++ itself, to remove it, you have to solve the problem yourself, by unregistering one of Notepad++ services. 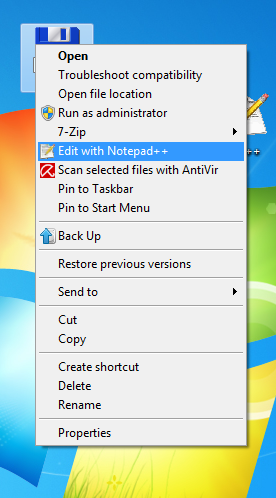 Read More "Remove “Edit with Notepad++” option from context menu"
PuTTY is one of the first programs, that I install on every computer. Since, it stores sessions in registry, it is a bit difficult to migrate sessions between computers. So far, I manage to do this with a little bit help of regedit.exe program and guides like this one. Today, unfortunately, I hit the wall, when my brand new installed Windows 7 told me, that it can't merge entries from my putty.reg file, because it can't access Windows Registry. Read More "Migrate PuTTY sessions between computers"
Read More "Reverse geolocation with OpenStreet Maps reverse geocoder. Pros and cons"
Note, that this list contains only "full featured" countries, without any dependent territories, special municipalities, incorporated territories etc. So, you won't find here many of the Oceania's or Antarctic islands. Also very small, Caribbean-based dependent territories are not listed here. Note also, that this list contains both North America's and South's America's contries put together. Read More "List of all countries in the World, split by continent"
Read More "Setup local FTP server on Windows as quickly as possible"
Digital Oceans has officially opened new AMS2 datacenter in Amsterdam. This event forced me to do some small tests on quality of services, from my own (Poland's perspective) point of view. I'm not talking about Quality of Service, because this is beyond any discussion. With standard (simple to answer) tickets being answered with 3-5 minutes (!!!) and with more complex cases solved with 3-5 hours, Digital Ocean's set itself a new world-standard. I have never found or met support of this scale. So, if we're not talking about QoS, lets talk about performance. Read More "Digital Ocean’s introduces AMS2 datacenter"
Are password-protected ZIP files really secure? In general, password-protected .zip files can be considered secure. check file types (try to send encrypted, password-protected ZIP containing EXE file via Gmail). Read More "Are password-protected ZIP files really secure?" This article covers topic of migrating your existing website to host it under new domain. For example, you had your website hosted under some free domain (i.e. mike.freedomains.gulp.co.cc) and now you have grown enough to migrate it under your own domain (i.e. mikerules.com). Here you'll find steps required to perform this migration as painfully as possible. Read More "Migrating website to a new domain"